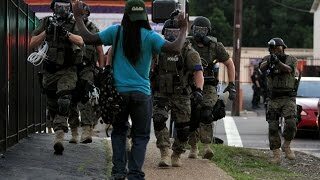 Let’s be honest – Ferguson, Missouri is under military occupation right now, and the entire world is watching in horror as militarized police fire tear gas and rubber bullets at unarmed protesters. Yes, the rioting and looting in Ferguson needed to be stopped. If order had not been restored, more stores and businesses would have been destroyed. However, there is no excuse for the brutal tactics now being employed. At one point, police snipers were even using laser scopes to target protesters that were obviously unarmed. Sadly, this is just a preview of what is coming to America in the years ahead. As the economy falls apart and people become even more angry and even more frustrated, there will be a lot more incidents of civil unrest like we have just witnessed in Ferguson. And in response, the federal government and our overly militarized police will seek to crush those uprisings with overwhelming force. How is it possible that our once very peaceful nation has fallen apart so dramatically? What we just watched happen in Ferguson was truly bizarre. If you didn’t know any better, you might have thought that you were looking at images from a really bad post-apocalyptic disaster movie. Last night, as the images and stories from Ferguson, Missouri, joined the news churn, many who registered their thoughts via social media noted that what they were seeing—policemen with dogs and AR-15 assault rifles standing in a Stygian, blue-lit cloud of tear gas; crowds of protesters with their hands in the air, screaming “Hands up, don’t shoot”; members of the press being removed from the scene—did not look like America. And I will certainly agree with that. It did not look like America. At least not the America that I grew up in. Cheryl Chumley has been watching developments in Missouri, where Michael Brown was shot over the weekend, and just overnight two more people were shot, including one by police. “Armored vehicles on patrol, Kevlar-wearing, camouflage dressed officials carting high-powered rifles, tear gas wafting through the air – sounds like something right off the streets of Iraq. But it’s not. It’s actually the scene that’s playing out in Ferguson right now, with SWAT-type police taking to the residential streets for crowd control duties,” she said. Was all of this really necessary? The rioting and the looting had already ended. Was there really a need to fire tear gas at unarmed people? In this day and age, images like this spread like wildfire. Thanks to social media, people all over the country and all over the planet will get a first-hand look at how brutal our militarized police have become. And the more attention this gets, the more likely that it is that violence will spread to more cities. Already, a major protest is being planned for Sunday directly in front of police headquarters in Los Angeles. A man was shot and killed on Monday by the LAPD and people are upset about it. They have seen what has been happening in Ferguson and now they want to take action. Since 2006, according to an analysis by the New York Times, police departments have acquired 435 armored vehicles, 533 planes, 93,763 machine guns, and 432 mine-resistant armored trucks. Overall, since Congress established its program to transfer military hardware, local and state police departments have received $4.3 billion worth of equipment. Accordingly, the value of military equipment used by these police agencies has increased from $1 million in 1990 to $324 million in 1995 (shortly after the program was established), to nearly $450 million in 2013. #1 In 1980, there were approximately 3,000 SWAT raids in the United States. Now, there are more than 80,000 SWAT raids per year in this country. Ultimately, these stop-and-frisk operations amount to much more than humiliating, demeaning rituals for young men of color, who must raise their arms and spread their legs, always careful not to make a sudden move or gesture that could provide an excuse for brutal — even lethal — force. Like the days when black men were expected to step off the sidewalk and cast their eyes downward when a white woman passed, young black men know the drill when they see the police crossing the street toward them; it is a ritual of dominance and submission played out hundreds of thousands of times each year. How can we reverse this alarming militarization of our police? The startling study, titled “Testing Theories of American Politics: Elites, Interest Groups, and Average Citizens,” is slated to appear in an upcoming issue of Perspectives on Politics and was authored by Princeton University Professor Martin Gilens and Northwestern University Professor Benjamin Page. An early draft can be found here. Will An Ebola Panic Be Used As An Excuse To Put Large Numbers Of Americans In Camps?